In Ooga Bouga players need to repeat a series of guttural noises, then add to the chain. At the start of each round, players are dealt three cards face-down and those cards remain hidden; each card shows a "word" and associated illustration – "Miti" for woolly mammoth and "Atrrr" for fire. The first player of the round lays a card in the center of the table, makes the noise, then points at another player, saying "Ha!" That player must add a card, repeat both sounds in order, then choose someone other than the player who chose him. Some cards have actions and add a gesture such as sticking out your tongue or pounding the table. A round ends one of two ways: (1) A player is accused of messing up, with accusers pointing at him and saying "Ho!" If the accusation is correct, the player "scores" all cards in the center, plus one card from each accuser; if not, then the accusers split the cards among themselves. (2) A player adds his third card to the pile and correctly repeats all the sounds, ending with "Ouga Bouga!" As a reward, he distributes the cards in the center, as well as any penalty cards previously collected, among all the players. New Year’s Eve board game parties are the tradition in my circle of friends, and on the eve of 2014 my friend broke out a small, circular tin can full of circular cards. Even the packaging conveys a feeling of silliness, and the name of the game warns you that you, and your friends, are about to be in stitches. 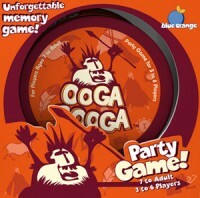 Ooga Booga is a memory game. Each circular card has a cave-painting piece of art on it like a yak, a campfire, or a feather (among many, many other items). Each also has a word printed on it — the “caveman” word for the depicted item. A few cards instead have actions, such as sticking out your tongue or banging on the table. Players take turns playing cards in a line, with the new card covering up the text on the previous card, but not the picture. Each player, in turn, repeats the entire sequence of words, actions, and grunts “HA!” at the end of the string of words. When a mistake is made in the sequence, other players bang on the table and shriek “Ooga booga!” to penalize the error, then play starts fresh. Empty your hand to win the game. It gets hilarious very quickly. This game took us 30 seconds to learn. There’s nothing complex about it. First, obviously, a player with a great short-term memory is going to excel at this game. I can’t remember what I ate for breakfast, but my friend remembers details of television episodes from the 1990’s. Players like me are going to be stumped by a string of 4 cards — meanwhile, players like my buddy will go through a ten-card string rattling off words like “Yaka pooka oogah cha maka wakka ha!” with ease. Secondly, if you play this game often and pay attention to the images, it’s like learning a foreign language. Some word and cave painting combinations are easy to remember, others likely are easy to learn after just a few plays. If you have a few minutes left before the pizza arrives and don’t want to be interrupted during your 4-hour session of Arkham Horror, or if you’ve had a few drinks and just want a fast-playing, mindless, silly game full of laughs with your friends, give this one a shot. It’s probably not going to become a weekly must-play favorite, but for the price it’s the kind of game that’s fun for an occasional play (when the guy that owns it has forgotten most of the word-image associations). Add a Review for "Ooga Booga"